This past November, Kate McGovern published a new book entitled A Public-Sector Journey to Lean: Fighting Muda in Times of Muri, which documents the author's Lean journey based on her experiences at the New Hampshire Bureau of Education and Training. Lean initiatives in the public sector face greater obstacles than their private sector counterparts in three areas: erratic and unreliable commitment of resources, risk-averse leadership, and the responsibility to serve dual customers. Resources: Elected officials who set public budgets must be persuaded to prioritize efficiency initiatives. Funding is often erratic and inadequate, lacking the staff resources necessary to train, facilitate, and coordinate improvement efforts. Risk-averse leadership: Aligning authority and responsibility at the gemba (like Toyota’s Andon cord) is counter-intuitive and frightening for traditional administrators. The multiple layers of checking give them a sense of security, making them reluctant to Lean processes. What if something goes wrong? What if it gets in the press? Dual customers: The end-user customer is an individual applying for a building permit or a driver’s license, borrowing a library book, or reporting an emergency. The public is also customer, relying on the regulatory system for health and safety. For example, the public values the enforcement of building codes. Permit applicants value a fair, efficient process with courteous, professional staff to assist them. Consider a Lean event to design a process so that every qualified applicant receives a permit within two weeks. The team would identify why customers fail to meet the meet the qualifications, and develop countermeasures such as fact sheets, checklists and staff assistance. To ensure a quality outcome, the team would consider the purpose of each requirement and recommend modifications, if appropriate. Then, they would design the most efficient way to confirm compliance and validate eligibility. Are any readers currently part of a Lean initiative within a public-sector organization? Do you agree with Kate's overview of the specific obstacles faced when undertaking the improvement journey? What are the Key Ingredients for a Lean Culture? Paul McCartney, while in the Beatles, famously claimed that “money can’t buy me love" -- According to author Richard D. Brimeyer, money also can’t buy Lean. Rick’s book Working Great! 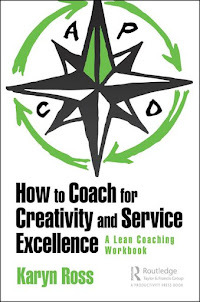 Lean Leadership Lessons for Guiding Your Organization to Excellence contains 52 lessons for leader-managers, each with challenges for applying the lesson. The format is particularly conducive to a leader’s book club. Unlike so many management fads (reengineering, quality circles, etc.) that have come and gone over the decades, Lean owes its endurance to the fact that it benefits all stakeholders -- customers, owners/funders, and employees. Waste doesn’t help anyone. Unfortunately, I believe a lot of organizations embark on a Lean expedition underestimating the behavior changes required of managers at every level. Everyone understands the relevance of their work. Employees feel appreciated for who they are as well as what they do. Pathways for growth are evident. Successes (and efforts) are regularly recognized. A fair and responsive system exists for dealing with performance issues when they occur. Regardless of what we say, employees believe what we do. So being clear on key behaviors for leader-managers is very important. Ironically, these behaviors are consistent with any excellent supervisor, regardless of whether they are working in a Lean environment where flow and pull are practiced or not. Thus, the word “Lean” in my subtitle is practically superfluous, but these key behaviors are absolutely essential for establishing a Lean culture. My goal for the book Working Great! is to provide a simple and useful resource for leader-managers, regardless of their level or experience. I hope to take the mystery out of culture by tying it to the behaviors to which they can hold themselves, and each other, accountable. What do you think of Richard's points? Does the behavior of leadership at your organization reflect the true goal of the Lean initiative?